As natives of the Upper Midwest, we find ourselves frequently subject to stereotypes in media. Actors portray us in film, theater, radio, and television by exaggerating our accent and donning outfits that almost exclusively consist of fur hats, flannel shirts, and knee-high winter boots. Fortunately we’ve learned to laugh along and occasionally accept that these depictions aren’t actually that far from the truth. But, there is a recurring misrepresentation of the Midwest itself in mainstream movies that we seem to continually overlook. This is apparent in films like the Coen brothers’ Fargo (1996), Donald Petrie’s Grumpy Old Men (1993), and Craig Gillespie’s Lars and the Real Girl (2007). For instance, in the opening credits of Fargo (1996) we open up to a blank white landscape. A car appears from nowhere over a long period of time. It tows another car equal in size behind it as if to say, in winter, one must carry the weight of two. Petrie’s Grumpy Old Men is much goofier, featuring comical slapstick behavior with music to match. All in all, however, this film reflects the same damp and idle lifestyle as Fargo. In this scene, two grown men get in a fight out on a frozen lake and are egged on by fellow ice-fishermen. The fight only ends when an even older man, a former teacher, scolds them for their quarreling. They are children — malformed men. Finally, in this clip from Lars and the Real Girl (2007), Lars (played by Ryan Gosling) viciously throws a rose off screen when faced with the opportunity to give it to a cute new girl in town. Notice that while winter hasn’t quite set in, the trees in the background are bare. All that remains of nature are the people within the scene, their heads down, bodies hidden under layers of polyester. Even when Lars finds himself holding a freshly cut rose, he tosses it off screen, as if protesting life. All these films take place in desolate landscapes, bereft of life, within which characters either flounder emotionally or, in the peculiar case of Fargo’s Marge Gunderson, they are unmoved, free of emotion, almost un-human. Rather than showing how the Upper Midwest is misrepresented in film, these scenes reveal how our home has been under-represented. Viewers of these films are only given a small fraction of our story. The benefit of this under-representation is that the appeal of our home remains, at large, a secret. We remain a flyover region, the precious space over which coastal commuters can indulge in airborne libations and precious siestas. However, there is an artist at the Walker whose creative and curatorial work is deeply concerned with the misrepresentation of her home, an under-representation with much at stake, that is built upon romantic visions belonging more to Western colonization than simply dramatic entertainment. Album: Cinematheque Tangier, a project by Yto Barrada, is a film and visual art exhibition that will be on display in the Burnet Gallery until May 18. Visitors who explore the gallery and Barrada’s other works will find that the artist is very much concerned with the misrepresentation of Tangier. For example, her photograph Briques (2003/2011) — which is not featured in the show — reveals a blunt and honest look at the haphazard beauty of scattered housing projects in Tangier. It is a photograph that wishes to tell the whole truth, a truth that escapes alluring and romantic vacation photos. It encompasses a bleak existence, while holding a childlike curiosity for the hills that roll off far into the distance. 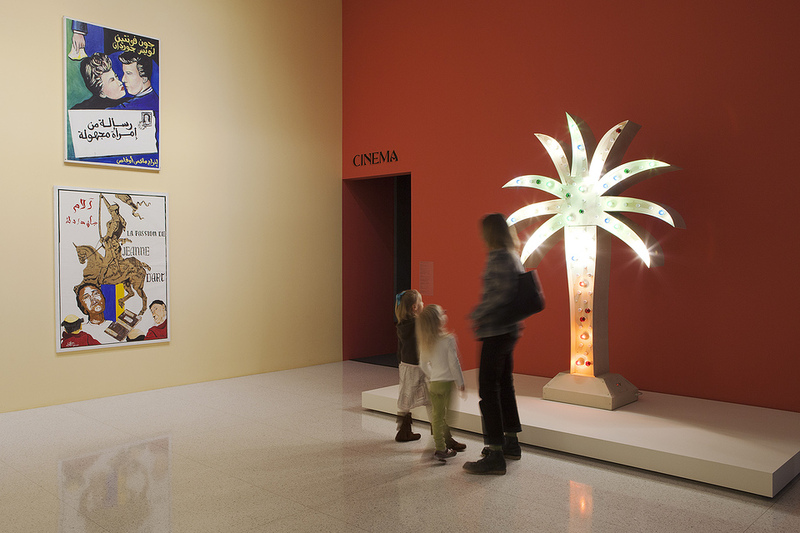 In contrast, her sculpture Palm Sign (2010), with its multicolored marquee light bulbs on an aluminum and steel palm-shaped sculpture, satires the exciting and exotic dream that palm trees have come to symbolize in advertisements and popular discourse around the world. 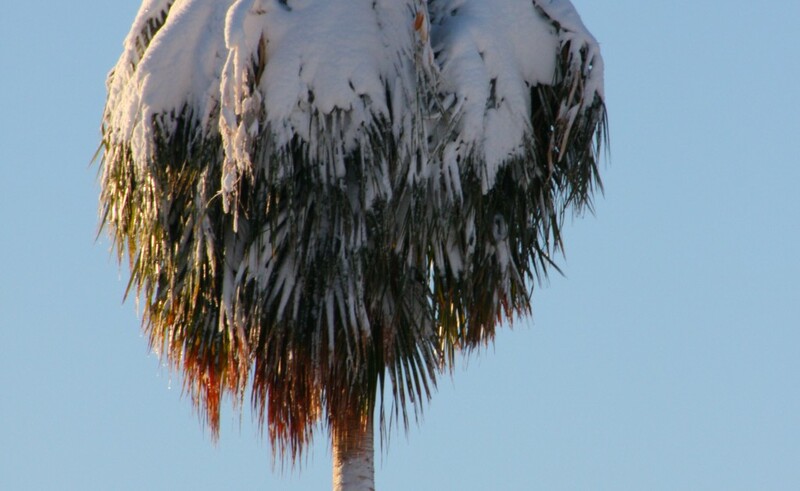 Simultaneously, it addresses the palm tree as non-indigenous to North Africa, inherently a symbol of colonization. While these works are both beautiful and striking, they seem to begrudge the artist’s relationship to the place they represent. As president of the Cinematheque de Tanger, a nonprofit organization based out of the Cinema Rif in Tangier, Barrada has also hosted thousands of screenings and promoted North African cinema worldwide. As part of the Walker exhibition, the upcoming film series A Riff on the Rif: In the Spirit of the Cinematheque Tangier is comprised of several films curated by Barrada. These stories are told in places like Tangier, Casablanca, and Algiers — cities that we in the United States only encounter on very rare, often brief cinematic occasions that are emblazoned with wildly exotic themes and Western obscurity. While audience members may expect to be immersed in unfamiliar territory, they will find instead that stories of the Rif are intimately threaded to somewhere deeper than setting or place. They are, in fact, irrevocably invested in what it means to belong to North Africa. This is undoubtedly something Barrada hoped to achieve in this program. The Rif series is an important opportunity for viewers to experience a part of the world in ways they never have before, ways that are far more intimate and native. Characters of The Rif are genuinely of the worlds they live in, and many of their stories were born out of real experiences of the filmmakers. If you are the least bit concerned with misrepresentation, or would like to see North African cinema curated by a North African, this is your chance.